15. "Workman repairs walls of Masada": Judean Desert. The notion of repairing, like returning, is central to Jewish thought. These concepts are reiterated each Rosh Hashanah (New Year), for example. 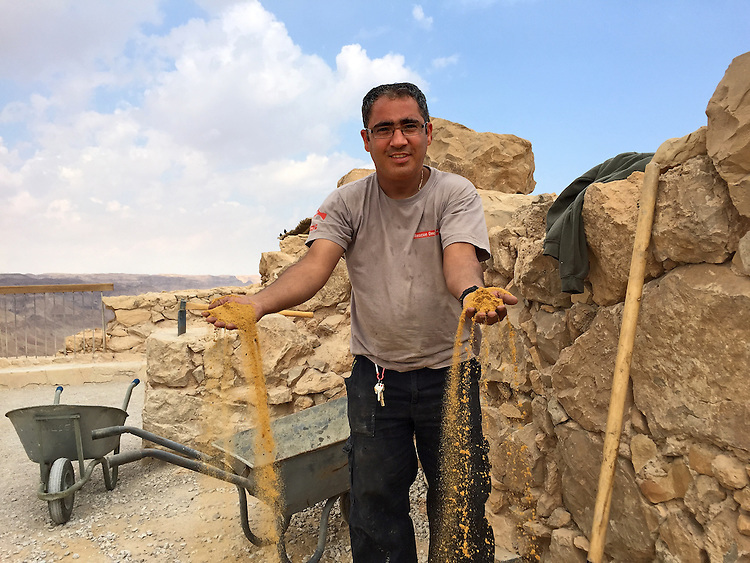 So for me, the eloquent gesture of golden sand streaming through this workman's hands as he repairs Masada, a place Jews return to because it resonates with resistance and freedom, seems especially apt. Masada is a UNESCO World Heritage Site. Located on an austere desert bluff high above the Dead Sea, it was the dramatic setting for a pitched battle between Romans and Jews that in 73 CE ended with the Jews choosing suicide over slavery. As a result, Masada has become one of the Jewish People's greatest symbols -- if not of freedom, then certainly of zealous resistance to coercion. When I visited Masada, I climbed to the top on the more than two-thousand year old rocky path like my ancestors. While walking around the fort's remains, I filled my lungs with thin air, saw bright light and a vast space that felt almost cosmic. I met this workman applying earth, like a plaster, to the crumbling walls. The earth was ochre and looked precious, like gold. Spontaneously, the man reached down and scooped up the sand with his hands: "This is Eretz Y'Israel, the land of Israel," he seemed to say. As the sand streamed through his fingers, he smiled at me.